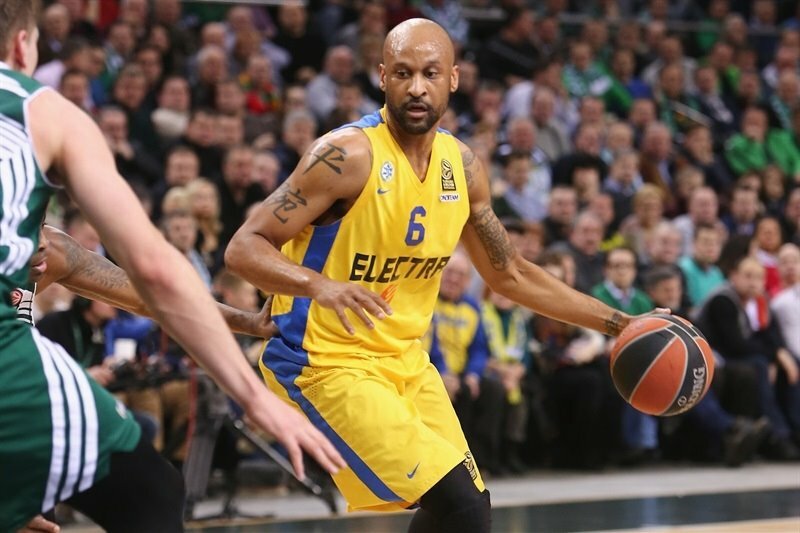 In a game of swings, Maccabi Electra Tel Aviv uncorked the last one to claim a 66-73 road win over Zalgiris Kaunas in Group E on Friday. 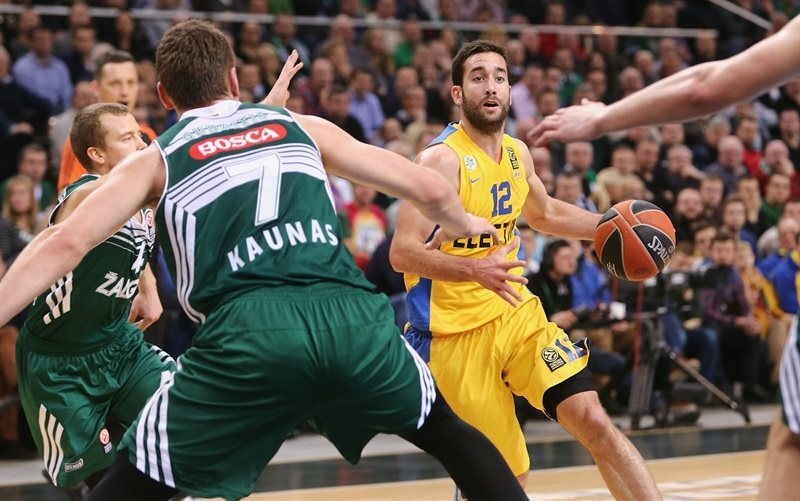 Maccabi improved to 3-1 and takes over second place exclusively in Group E, while Zalgiris fell to 1-3. 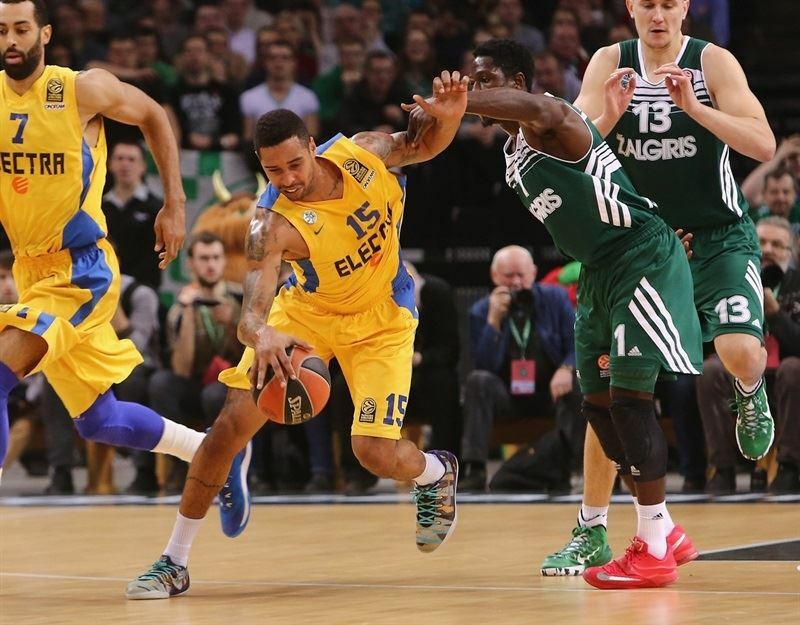 After Arturas Milaknis fired Zalgiris in front early, Sylven Landesberg sparked a 12-0 Maccabi run into halftime. 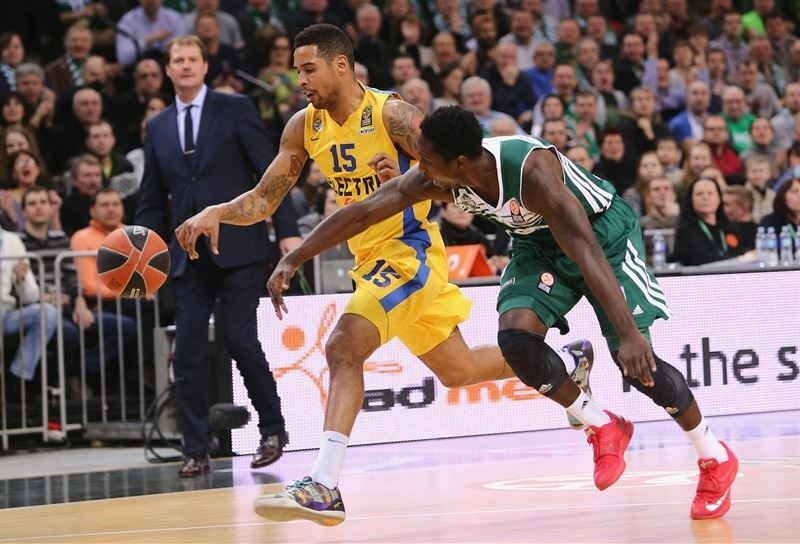 Zalgiris would lead again on James Anderson's 2 three-pointers to finish the third quarter 52-48, but Jeremy Pargo engineered 9 unanswered points late in the game for Maccabi's successful final push. 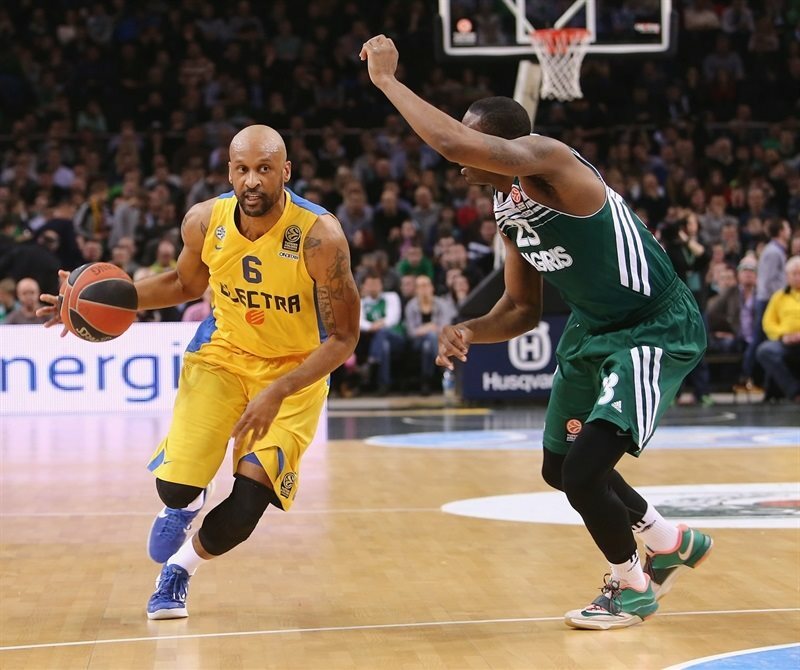 Landesberg led the winners with 20 points, the second-most of his three-year Euroleague career. Pargo had 12 points and dished 8 assists while Alex Tyus also scored 12 and made 6 blocks, tying the second-highest one-game total in Top 16 history. Devin Smith added 10 points and 3 steals for the winners. Zalgiris got a huge double-double of 18 points and 13 rebounds from Paulius Jankunas. Anderson followed him with 17 points. Milaknis made his first 4 three-pointers in a row bridging the first and second quarters and finished with 14 points as Maccabi's defense shut him down the rest of the way. Jankunas hit 4 free throws around an open layup by Smith to get the scoreboard rolling. Anderson downed a jumper from mid-range and tipped back his own miss for a quick 8-2 Zalgiris advantage. Sofoklis Schortsanitis scored a putback but Jankunas matched it for a 10-4 scoreboard. 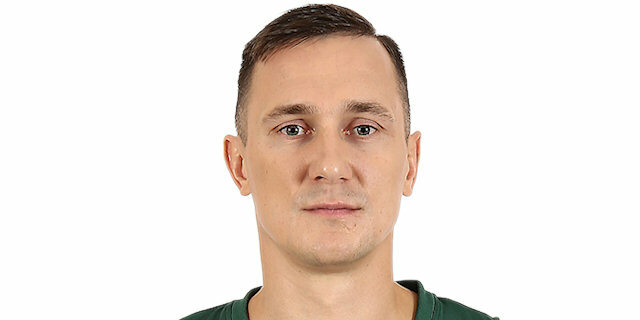 Pargo reduced the difference with 4 perfect free throws before Lukas Lekavicius and Yogev Ohayon exchanged baskets, then Anderson kept up the attack with a nifty up-and-under layup to keep Zalgiris in front 14-10. Pargo fed Schortsanitis for a dunk one dunk and then his substitute, Tyus, for another to draw the guests within 15-14. Jankunas answered with a baseline jumper, but Joe Alexander stepped off Maccabi's bench to hit his first two shots and put the visitors in front for the first time, 17-18. 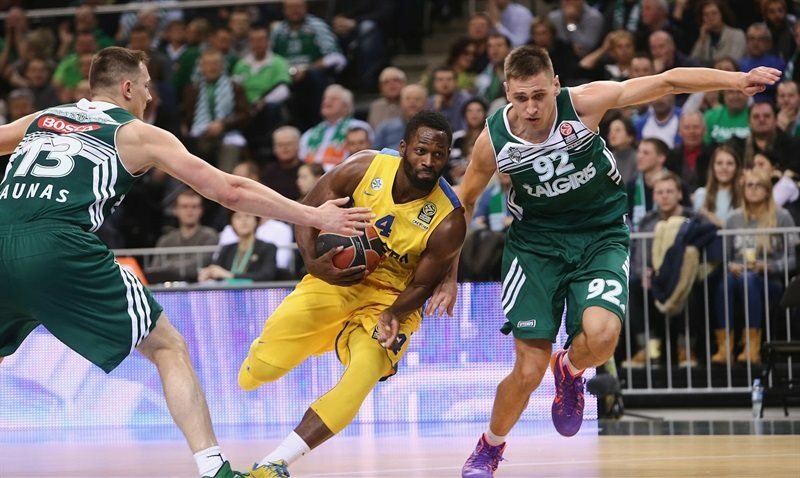 After a Zalgiris timeout, Maccabi kept it rolling with a short shot by Pargo. Jankunas answered inside before Landesberg entered to hit 2 free throws to make it 22-19. 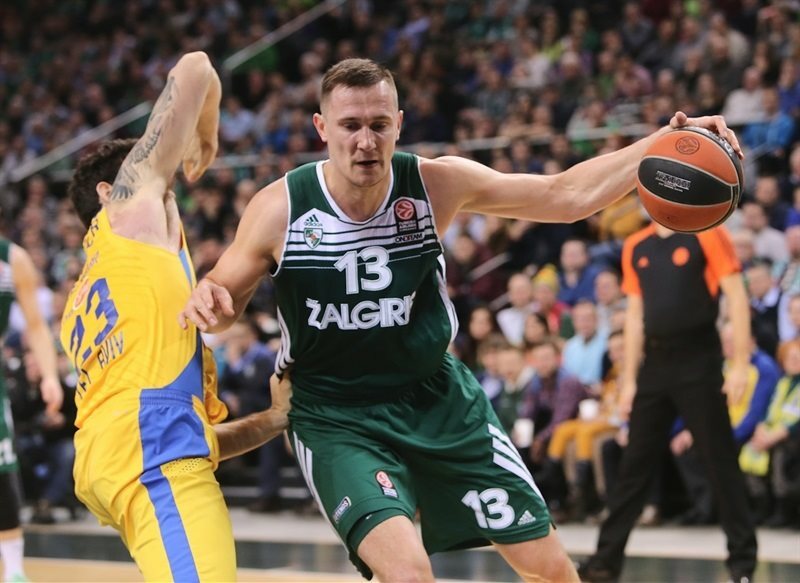 With 9 seconds left in the quarter, Milaknis used his first shot with from the arc to forge a 22-22 tie after 10 minutes and bring the Kaunas crowd out of their seats. 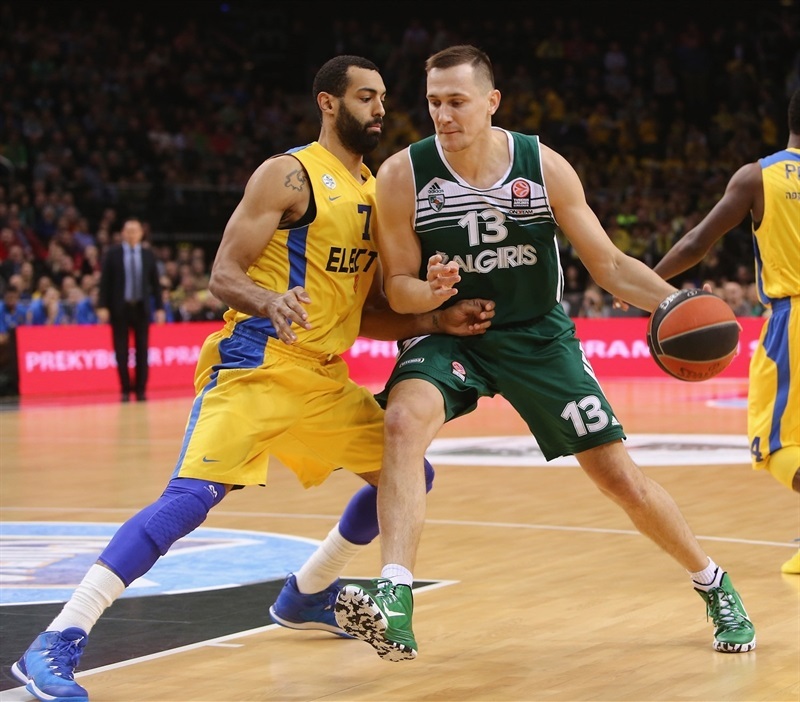 Milaknis was still feeling it to start the second quarter as Maccabi left him open to drill his second and third three-pointers in succession for a 28-22 Zalgiris lead. Now Maccabi needed a timeout, after which Landesberg made a pair of driving layups to close the gap. But Milaknis was hardly finished. His next triple hit nothing but net, making him 4 for 4 from the arc, then he stepped closer for a bank shot to make it 33-26. Landesberg got to the basket again for Maccabi, but Darius Songaila's put-back negated it, then Will Cherry fed Arturas Gudaitis for a slam and a new high lead of 37-28. After another timeout, Landesberg came to visitors' rescue with a triple, Maccabi's first. Then he tipped in a missed fastbreak layup to get his team within 37-33. Maccabi's defense created the next opportunities as Smith hit a basket, Ohayon buried a transition triple and Brian Randle finished a fastbreak. When Ohayon lobbed to Tyus for a dunk, Maccabi had closed the quarter with a 0-12 run and was suddenly ahead 37-40. Randle raised Maccabi's lead after the break before Anderson finally ended the visitors' 0-14 run with a triple from the wing, the first by any Zalgiris player except Milaknis. Robertas Javtokas got another point back at the foul line to make it 41-42. Lekavicius did the go-ahead honors with a runner over Tyus and then Gudaitis added a jump-hook at 45-42. Maccabi couldn't find the basket now, as the visitors went scoreless for more than 6 minutes and 9 consecutive misses until Smith finally dropped a hook shot. Fortunately for the champs, their own defense was holding, and they were only behind 45-44. Cherry stole and got the free throw line, where he made 1 of 2, but his next shot, a layup attempt, got swatted by Tyus, leading to a game-tying fastbreak by Pargo. Anderson stepped up then with a rainbow triple that Landesberg answered with a put-back. Then Anderson did it again, stepping back to hit an even longer triple on the buzzer to keep Zalgiris in the lead, 52-48, after 30 minutes. Maccabi's strong defense to open the fourth quarter sent Pargo for a fastbreak dunk before Smith went inside to tie the score, 52-52. Gudaitis and Smith then traded baskets in close before Tyus banked in a hook shot for a new Maccabi advantage, 54-56. Anderson put back an airball to even the score again, and it stayed that way after Landesberg drove strong and Gudiatis landed free throws. Pargo found the bottom of the basked on a reverse and then, after a timeout, fed Landesberg for a three-pointer that put Maccabi in charge, 58-63, with under 5 minutes left. 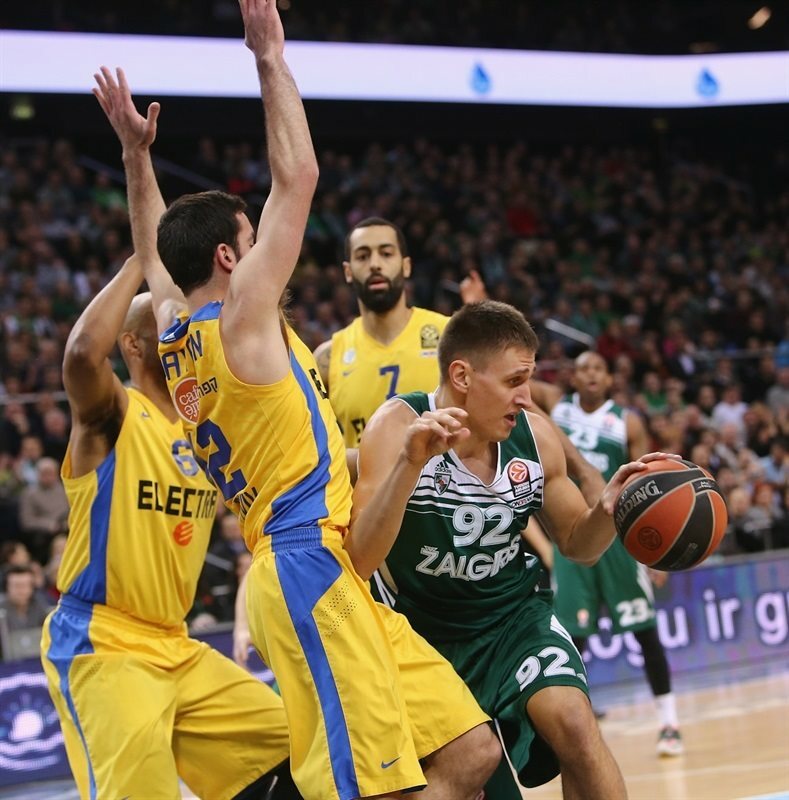 When Landesberg fed Tyus for an easy layup, Zalgiris needed a timeout, but little came of it. A tip-in by Tyus fell before Jankunas broke a 0-9 Maccabi run. His 4 of 4 free throws soon cut the difference to 64-69 with 1:25 to play. A last stand by the Zalgiris defense failed when Tyus converted a loose ball that found him in the paint with 55 seconds left to make it 64-71. Jankunas and Landesberg exchanged baskets next and Maccabi did what it had to on defense the rest of the way to take the victory back to Tel Aviv. 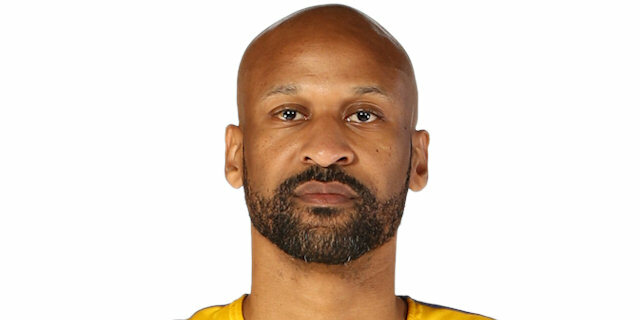 "We were in front in the first half and at that time we had only 1 turnover. When we started to lose the ball, we allowed the opponents to score easy points without any trouble. Paulius Jankunas was very solid tonight, but we couldn’t keep him on the court for 40 minutes. 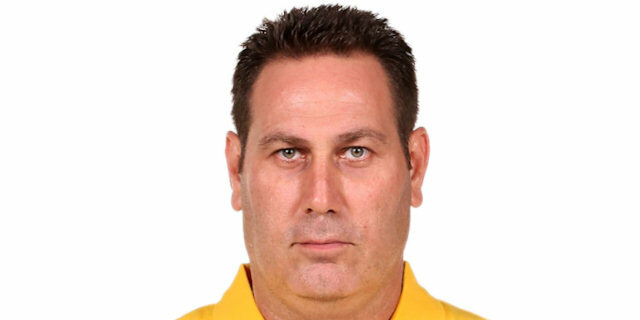 Partly we were in control on both offense and defense, but in the fourth quarter we allowed Maccabi to get into rhythm, they made a run and we didn’t have time to come back." "It was defense. 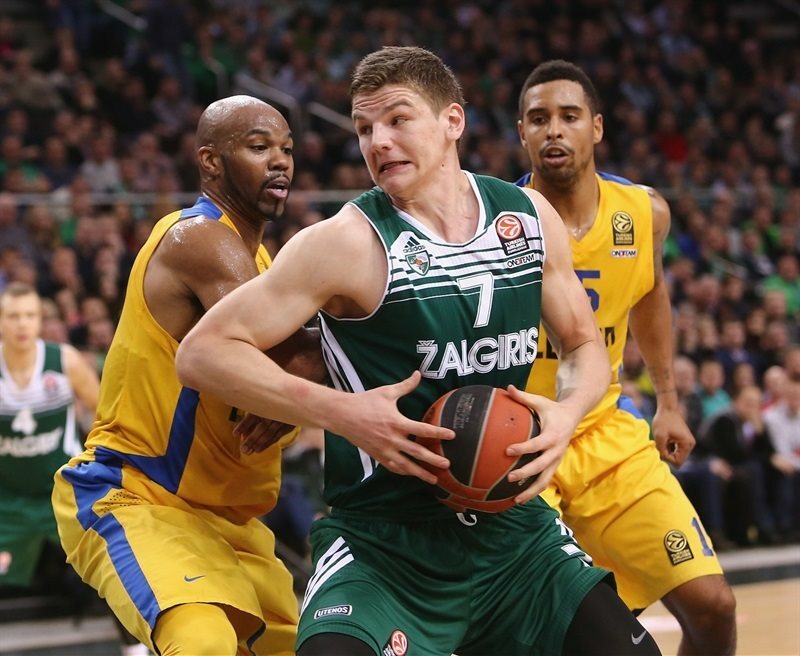 We talked before the game about having to stop Zalgiris, and we held them to 66 points. In the first quarter, they were able to run, but I am very happy with our defense after that and in the second half. We played aggressive and punished Zalgiris with fastbreaks. We controlled the tempo and got a very important victory." 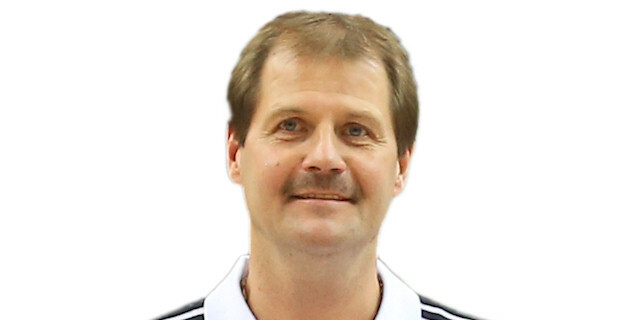 "We played good defense in the second half, did a good job rebounding the ball and getting out in transition. That helped us a lot. 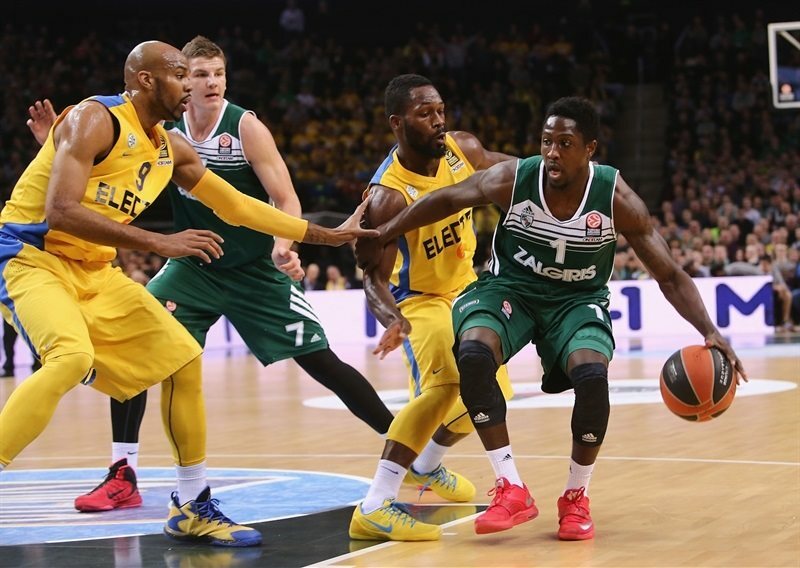 We knew Zalgiris was a good team, especially at home. They played hard and played until the end. We expected a fight and that's exactly what we got."